Although Millenium Hall is fictional, the title-page presents it as a domestic tour, and the explicitly 'improving' aim of the work is not out of keeping with other travels of its day. John Newbery, to whom Scott dedicates her book, was the first major English publisher of books for children, and she shared his sentimental objectives even though she did not write this book for a younger audience. The use of an anonymous male pseudonym befits the rather unusual voyeuristic frontispiece (Millenium Hall is a secular convent), but was primarily a way of lending the book, with its strong philosophical arguments for female education, a seriousness that Scott rightly believed a woman novelist's name would not evoke. De Beer Collection copy. Pencil note by I.A. Williams on end paper. De Beer Collection copy. Ownership inscriptions: Caroline Morris. M.F. Christopher, November 1859. 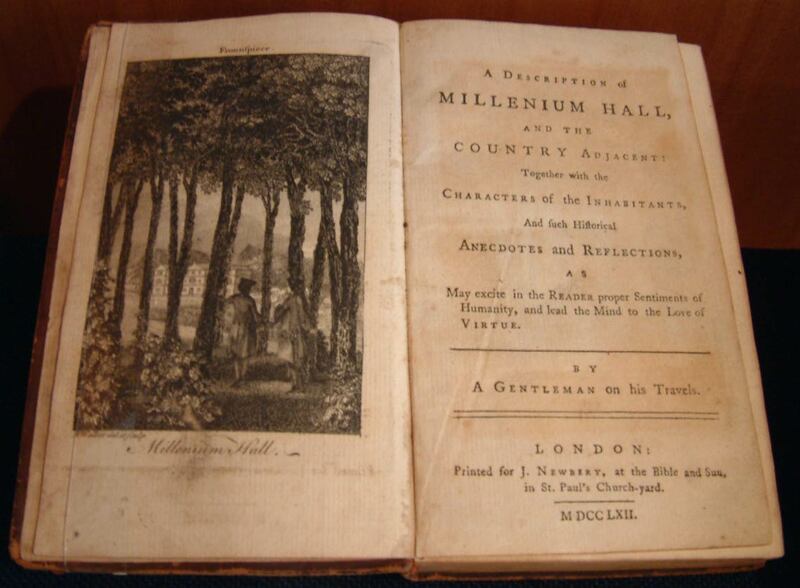 A description of Millenium Hall, and the country adjacent: together with the characters of the inhabitants, and such historical anecdotes and reflections, as may excite in the reader proper sentiments of humanity, ... By a gentleman on his travels. Gentleman on his travels (Lady Barbara Montagu and Sarah Scott), “Millenium Hall,” ourheritage.ac.nz | OUR Heritage, accessed April 26, 2019, http://ourheritage.ac.nz/items/show/7582.